Book Review: 'Crazy Rich Asians' By Kevin Kwan Filled with lavish settings and the personalities to match, Kevin Kwan's Crazy Rich Asians is the story of a wealthy heir and his over-the-top cohorts. Reviewer Tash Aw says the book is a breathless, high-speed romp. It's impossible to open the newspaper or turn on the TV these days without seeing some outrageous example of new Asian money. From a castle modeled on Versailles in Changsha to billion-dollar penthouses in Bombay to the Marina Bay Sands casino in Singapore, with its seven celebrity-chef restaurants, the inescapable truth looms before us: We Asians are not just rich but also, frankly, somewhat crazy. 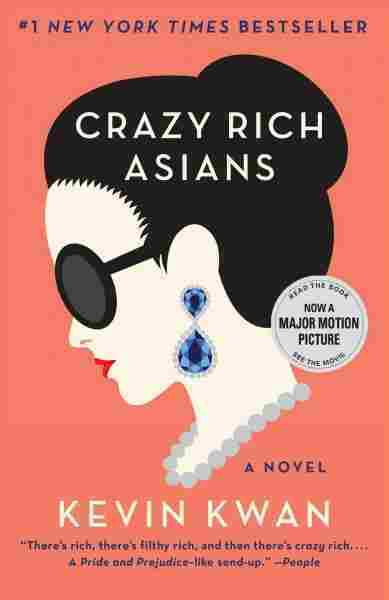 This world of absurdly over-the-top wealth is the playground of the characters in Kevin Kwan's breathless, high-speed romp through the lives of a group of megarich Asians. They're gathering in Singapore for the star-studded wedding of the two members of their set (note, for the time being, the lack of specificity in the term "Asian" — more about that later). The novel is built on an intricate web of shopping expeditions and gossipy lunches hosted by scheming ladies with boundless amounts of time and money. They're aflutter at the return to Singapore from New York of the supereligible, Oxford-educated Nicholas Young, heir to a massive fortune that symbolizes old South-East Asian money. What triggers this tsunami of soirees and dazzling weekends on private islands is not just the wedding of Nicholas' best friend, Colin Khoo, himself an heir to a huge old fortune, but the revelation of Nicholas' Chinese-American girlfriend, Rachel, whose appearance provokes more bullying and jealousy than the tiny island republic has ever seen. Imagine Mean Girls rolled into the cult 1980s TV series Shanghai Tang and you'll get an idea of the epic scale of what poor Rachel is subjected to. It doesn't help the ultrasensible Rachel that everyone she encounters in the novel is extraordinarily rich or beautiful — usually both. There's Astrid, whose poise and beauty are the envy of the whole of Singapore and who jets into Paris to hoover up haute couture collections before they even reach the runway; her chiseled, "fiercely handsome" husband, Michael, a Cal Tech-trained ex-Special Services Army man; Araminta, the bride-to-be, whose private jet contains a "library-slash-media room" and an Ayurvedic yoga studio; Shang Su Yi, who lives in a mysterious faux-European mansion on an estate in the middle of Singapore so private that even Google Earth doesn't show it: The cast of gloriously overblown characters is never-ending in its capacity to pile excess upon excess. It's precisely this gleefully camp humor that saves the novel from being a roll call of predictable characters who flirt outrageously with Mills & Boon cliche ("He was just so startlingly attractive ... with his stubble and the rumpled shirt"; "Then there were those piercing, deep-set eyes and the washboard abs rippling along his lean torso" and so on). The absurdist comic touches provide the novel with its best moments — such as the blue jay that pecks repeatedly at the reflection of a Damien Hirst painting, and Colin and Araminta's wedding dance to Dolly Parton's "I Will Always Love You," with alternating verses in English and Mandarin — and also carry off the knowing silliness of patisserie-inspired names such as "L'Herme-Pierres" and "de la Durée." Rachel's squeaky-clean naivete is a clever foil to the intricate workings of the high-glamour Asian set around her. Chinese on the outside but all-American on the inside, she allows us to see the myriad nuances of intra-Asian culture that the novel goes to great lengths to show: the distinction between the old-Chinese traditions of Nanyang and contemporary Mainland habits; the snobbery attached to Asians who speak English with British rather than American accents; the history of the Peranakans; the fact that Singaporeans are considered by other Asians to be the most uptight of all overseas Chinese — the list is rich and colorful. Nicholas explains such things to the down-to-earth, slightly dowdy Rachel, who doesn't seem to know anything about Asia — she's clueless about the way hawker centers work, finds it curious that Singaporeans obsess about food, and generally regards Singapore with the wide-eyed fascination of someone who has never been exposed to Asian culture. The expository nature of the novel is no more evident than in the copious footnotes, whose chirpy humor can't disguise their earnestness in explaining Malay honorific titles or Hokkien swear words. The Asians in question are largely Singaporean Chinese. "Crazy Singaporean Chinese" doesn't really trip off the tongue — yet the novel does offer a more interesting picture of Asian life than the vagueness of its title suggests. You might be tempted to read this book as a commentary on the rampant materialism taking over Asia, or a text on Asian post-colonial revenge (for there is a fair amount of gloating over the West's financial decline, such as in the novel's prelude). You might find fault with the novel's badly spelled Malay ("bobo chacha" sounds like a bourgeois bohemian dance, and "hun tum" a Chinese dumpling), or point out that double majors don't exist at Oxford, or ask why we never understand how these people have become so rich and vacuous. But, darling, such questions are simply not relevant. All that you need to know is that Charlie Wu, of the tech billionaire fortune, is in love with Astrid, the granddaughter of the Shang Su Yi, who is unhappy that her grandson Nicholas is not dating the Rachel Chu of the Taipei Plastics Chus, but they are all going to the wedding of Araminta Lee, of the luxury hotel Lees, and Colin Khoo, of the Khoo Teck Fong fortune and — alamak! — some big secrets might be revealed. Tash Aw's newest novel is Five Star Billionaire. It comes out in July.